Dynatel 2205 EMS Marker Locator. Locates Telephone markers. For use with 2200 series locators. The Dynatel 2206 locating accessory finds all EMS markers, and features a rotary switch which allows the user to select the frequency of the utility-specific marker chosen to locate. 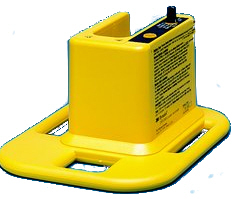 This unit was designed for multi-utility companies or contractors, who have the need to mark and locate key points for several types of underground facilities.